Take care of your plants in the most efficient way possible by using the free Plant Inventory List. This Excel template has a variety of functions; all centered on getting your plants the attention they need to thrive. This document comes packed with a way for you to inventory all the names and locations of your plants, even when they’re just seeds. You can take your gardening game to the next level by utilizing all the elements of this simple document. Make your garden beautiful this year; download the Plant Inventory List today. To download the free document, simply click the link located at the bottom of your screen. This template contains4 separate tabs to help you organize your garden into the well-oiled machine you want it to be this year. 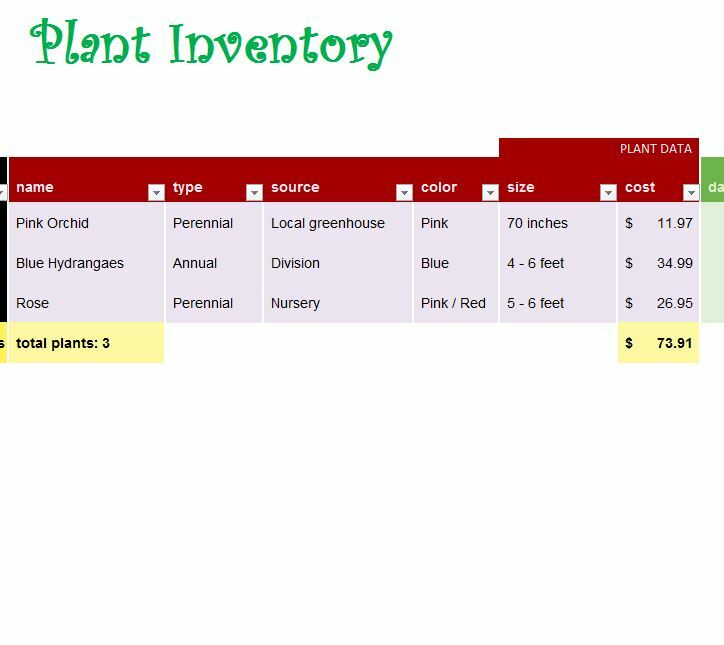 You can start in the “Plant Inventory” page by entering the important information about your plant. This page is also helpful if you’re just planning out your garden as well. The next tab, “Seed Starting Log” is a great place to enter information about your seeds. It can be pretty difficult to keep track of this information after you’ve planted the seeds because you can’t really see what plant they are. That’s why this tab is so crucial. The “Task List” can help you schedule tasks for plants that need special care. If you need to give one plant more water than the rest, you can enter that into the convenient calendar to the right. Finally, the “Garden Planning Grid” is a great place to visualize your garden-to-be. Simply enter your plants as they align with your actual garden. This way, you’ll always know where your plants are located, even if they’re still seeds. Now you can have the perfect garden by downloading and using the free Inventory List.